Explorer Scouts are girls and boys aged between 14 and 18 years old. They make up the fourth section of the Scouting family. 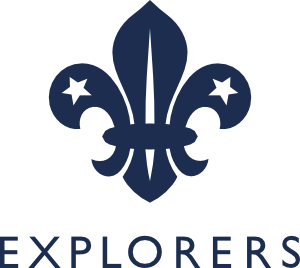 2nd Reigate Explorers meet every Wednesday from 7.45pm to 9.30pm at the 2nd Reigate H.Q. If you would like to join please contact us. Explorers are encouraged to lead themselves in deciding the programme and direction of the Group, with support and guidance from leaders. The Explorers create a flexible and active Scouting programme, with an emphasis on personal challenge and adventure. This section also includes the Young Leaders’ Scheme, where young people are able to take on a leadership role in one of the younger 2nd Reigate Scouting Groups. Explorers participate in a range of activities such as camping, caving, rock climbing, mountain biking, parascending, mountaineering and expeditions to name but a few. Highlights over the past year for the 2nd Reigate Explorers include building igloos and cross country skiing in Finland, gliding, learning survival skills (including cooking and gutting fish), three peaks challenge, pioneering and our casino night! At a District level the 2nd Reigate Explorers have enjoyed participating in archery, the County Night Challenge and the Great Escape. Explorer Scouting is designed to fit with other activities and can lead to the achievement of the Gold Duke of Edinburgh’s Award and the Queen’s Scout Award. These represent the highest level of achievement. D of E Gold Final?